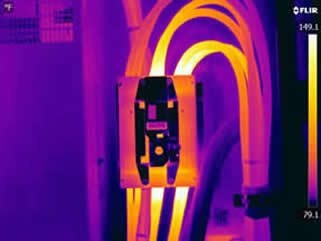 Thermal imaging is an effective tool in an electrical or mechanical distribution system predictive maintenance program. A thermal imaging scan increases confidence in equipment, decreases the potential for fire loss, reduces high-energy costs and helps avoid business interruption as well as satisfy your insurance provider’s requirements. Failure is not an option, you can depend on infrared thermography to avoid costly failures in power generation, transmission and distribution systems as infrared cameras detect anomalies before trouble strikes and service is affected. PM programs that use thermal imaging limit downtime by preventing unplanned shutdowns and by streamlining repair and maintenance planning. The resulting cost-saving and safety benefits from thermal imaging inspections include energy savings, protection of equipment and capital investments, reduced insurance premiums, faster diagnosis as well as establishing repair priorities based on severty. 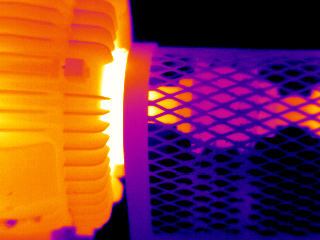 Thermal imaging inspections are non-destructive and do not interrupt day-to-day operations. An IR camera can detect problems and areas of concern that cannot be detected with a visual inspection, such as loose connections, faulty or overloaded circuit breakers and imbalanced loads in substations, transformers, swtichgear and discconnects. Test results on circuit breakers by NETA (InterNational Electrical Testing Association) show over a 15% failure rate. Defective circuit breakers, motor contactors and protective relays fail because they are mis-wired or broken. Trip linkages fail because of dust, hardened grease, corrosion and misalignment. The current-carrying parts and main contacts fail because they have been damaged by fault interruption or operating springs have fatigued so they no longer provide adequate opening and closing force. In today's economic environment, a combination of periodic testing to ascertain breaker condition including contact resistance, insulation resistance and / or hipot testing, operation and timing testing and visual inspections coupled with maintenance efforts which restores the breaker based on the results of the testing program. Optical gas imaging is becoming the standard for industrial gas leak detection. Infrared-based inspection has numerous advantages over tradition volatile compound detection methods. Not only is it faster and more efficient, but also it offers numerous safety benefits. Inspectors are able to perform surveys from a great distance, avoiding exposure to potentially hazardous chemicals. Optical gas imaging is the safest, most efficient method for leak detection in the oil refinement process. Leaks of most of the light end products and intermediates of fuel processing can be easily detected by gas imaging cameras, from gas down to kerosene. Additionally, the major natural gas products, methane and ethane, are easily detected by thermal imaging, and we provide leak detection services to all portions of the industry, from production and storage to transportation and distribution. A wide range of hydrocarbon and inorganic chemicals show good visibility with gas-detecting cameras, regardless of purity. In any given petrochemical facility, there are hundreds, or even thousands of potential leak sources. The use of traditional testing methods requires the inspector to manually test each site with a volatile organic compound meter, or "sniffer". However, the use of IR imaging allows for testing of numerous sites in a faster time, thus making the process cheaper and more efficient. Leaks can be detected from many different sources in the petrochemical industry, but the most common leak paths occur from flanges, valve stems, machinery, passing valves, instrument connections, couplings, drain covers, holes, plugs and caps and pump seals. Sulfur Hexafluoride (SF6) is a gas commonly used as an insulator in the electrical utilities industry, typically in high voltage switchgear and transformers. Although very useful, it is a highly potent greenhouse gas, being several thousand times worse than CO2 in terms of environmental impact. Leaks commonly occur at flanges, bushings, bursting discs, and valve stems. Due to its unique properties, there are few alternative substances. Consequently, the US government is increasing regulation of the gas through a combination of incentives and punishments. In either case, reduction of SF6 emissions through leakage pays off. The long-wave FLIR cameras employed by our firm are highly sensitive to SF6, detectable to leaks as small as 0.25 kg/year. Ultrasonic Electrical Inspections: Arcing, Tracking and Corona all produce ionization which disturbs the surrounding air molecules. An Ultraprobe detects high frequency sounds produced by these emissions and translates them into the audible ranges. Ultrasound Bearing and Mechanical inspections: Mechanical movements produce a wide spectrum of sound. One of the major contributors to excessive stress in machinery is friction and Ultrasound instruments can detects such frictions. Leak Detection: One of the more popular applications for ultrasound is compressed air leak surveys and users are able to detect and analyze on cost reduction due wasted energy while demonstrating the deduction of a plant's carbon footprint. Failure is not an option, you can depend on infrared thermography to avoid costly failures in power generation, transmission and distribution systems as infrared cameras help find anomalies before trouble strikes and service is affected. According to the US Department of Energy Industrial Technologies Program, "motor-driven equipment accounts for 64% of the electricity consumed in the US industrial sector. Considering these statistics, Motor Circuit Analysis (MCA) is a very attractive and important technology in the industrial sector. Many industrial gases and chemical compounds are invisible to the naked eye, yet companies transport and transform these ingredients every day. Optical imaging, using our FLIR GF-Series thermal cameras, offer many benefits compared to traditional "sniffers" because they scan a broader area more rapidly and in areas that are difficult to reach with contact measurement tools. Call us at 801.393.6050 - The Equipment Reliability Specialists, for a quote or more information. We have been a FLIR Systems representative and distributor for the past 15 years. 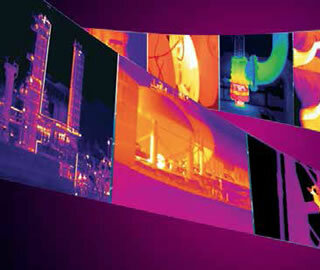 We specialize In thermal imaging and all our representatives are Level II Certified. We provide on-site demonstrations, training and support for as long as you own your FLIR camera.